WITH VACANT LAND becoming more and more scarce within close proximity to Australia’s major city centres, it has become increasingly necessary to develop or extend existing properties. However, as a Commercial property owner, how should you to tackle this dilemma? When dealing with older structures, the answer is often “NO”. This is usually based on the design standards and loading criteria that was used to design the original building. As design standards become more stringent, older buildings are often not compliant with current standards let alone having capacity to withstand further loads. If only a single level is being added and it can be determined that the existing structure is close to the required capacity — then strengthening the structure may be the best approach. If your are adding multiple levels, then the existing structure will not have sufficient capacity to withstand the additional loads. Therefore, you can design the new building to stand completely alone within the existing structure. This way the new building does not rely on the strength or condition of the structure and also does not impose additional load onto the original building. If the existing structure is preserved, often the layout of the new building is restricted. For this reason, many developers choose to demolish as much of the original internal structure to allow for an easier build of the new functional “inner shell”. Around the city, you will increasingly see building sites with a brand new structure popping up out of the middle of an old beautiful building — like what’s about to happen on the property above. The most common approach is to maintain the facade of the building and demolish everything else. This leaves the inside of the site clear to develop unobstructed. 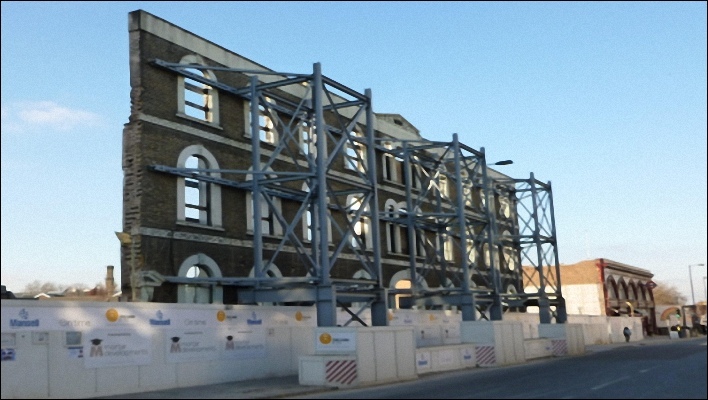 During construction, the facade is maintained in its current position using temporary steel support and after it is supported by the new building. Those that constrict the functionality of the building and how it is constructed.